Coconut BAR SOAP All Natural Handcrafted Soap. 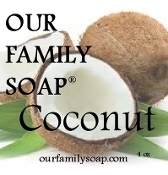 Our classic soap scented with the exotic scent of Coconuts. Generous 4 oz. bar. A combination of saponified olive oil, coconut oil, palm oil, Coconut EO/FOBlend. Coco Butter and Vitamin E.